I believe this venue is a local attraction, though I would imagine there to be similar places throughout the country, though most likely by different names. It has all the main ingredients of a Chuck E. Cheese’s, namely lots of rowdy super-hyper kids running into you, token hungry arcade games, and of course, all the pizza and pop you would need for a birthday party of all your kid’s 15 closest friends. This particular facility’s niche (if the name didn’t give it away) is indoor bouncy houses and slides–a great idea for small children in the beginning stages of walking. What better than a some-what contained play area with 5 sides of airy bouncy squishy fun and no worries of bodily harm if your little one is a tad on the clumsy side? Not having been a regular at Chuck E. Cheese’s myself, I didn’t quite realize the extent that the “running into you” part is actually more accurately “running into my child” and knocking him over. But thankfully, at least at the venues I’ve been to, special consideration has been made to toddlers by giving them their own area and/or designated play time. The benefit, of course, is all up to just how much it’s enforced. 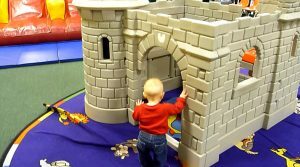 For the most part, Bounce Magic segregates its toddlers pretty well and we enjoyed over an hour without incident. Interaction between the toddlers was much more direct than Gymboree (where the parents were very much engaged in the play time with their child, and thus families kept more or less to themselves). Since I was able to crawl around in the bouncy houses with my son, I was more comfortable with the idea (and actuality) of him crossing paths and sharing space with those rowdy playmates. 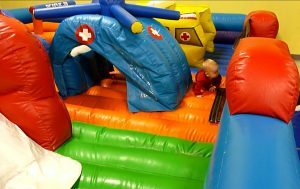 From the physical development side, walking around in a bounce house will certainly build balance, and it did a great job of tiring him out. Overall, I did have a good time as did my son. We happened to go on a busy Saturday afternoon a few weeks ago, so even though I would go back, I haven’t yet. He did end up spending more time wandering around instead of bouncing and jumping, and the lights and action of the arcade games mesmerized him (thankfully the innate motions entertain him enough now without him knowing what happens when you put a token it! ).